The exhibition was curated by Jessica Barber and Audrey Chaney, both recent graduates from the M.A. Fashion and Textile Studies program at the Fashion Institute of Technology. During the late nineteenth century the American public became increasingly interested in leisure sports. The medical community began to feverishly promote healthy lifestyles, and newspapers and magazines helped to disseminate the benefits of new sporting activities to the masses. 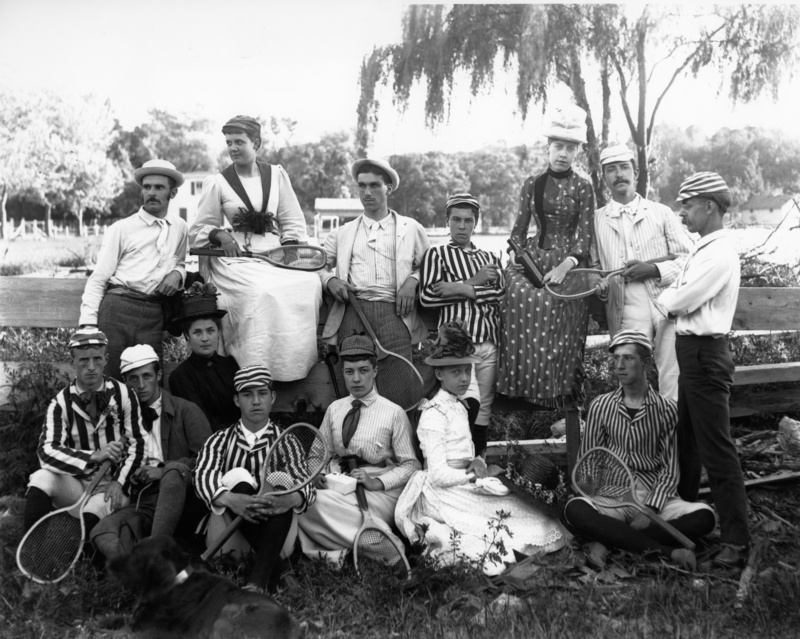 Although sporting activities allowed for both genders to participate in tennis, hiking, and bicycling, social decorum required that they clothe themselves in attire that was specific to the activity but also adhered to late Victorian moral standards. While far less formal than ordinary attire, these garments still followed the accepted rules of fashion. This exhibition showcases the ways in which Americans dressed themselves for play from 1870 to 1900. The clothing worn for sport at this time greatly resembled the styles of morning dress worn in everyday life. 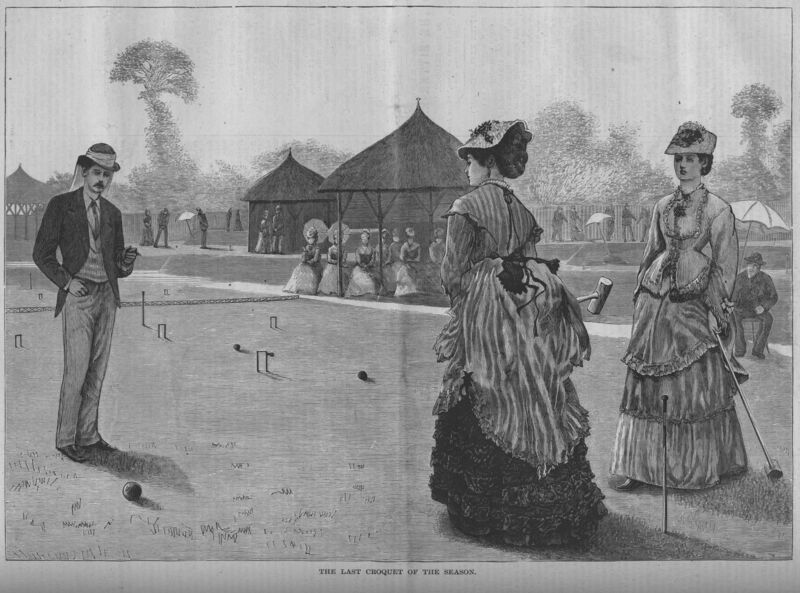 Ensembles worn for croquet and ice-skating were constructed with elaborate drapes over bustle cages during the 1870s and 1880s, while giant, puffed “gigot” sleeves adorned sporting shirtwaists and jackets during the mid-1890s. Despite newfound social freedoms experienced through sporting activities, few concessions were made for the comfort of female players in particular: decency still required that corsets be worn, even while swimming and sea bathing. 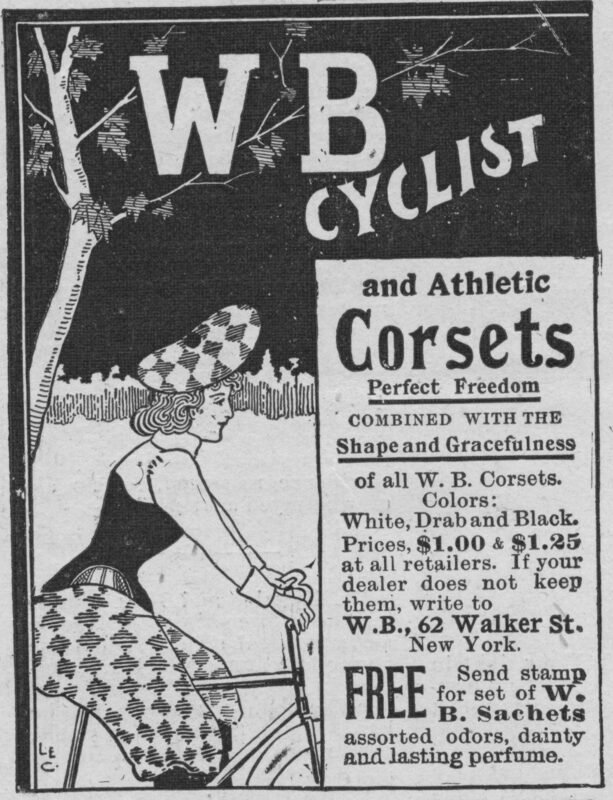 However, activities such as bicycling and gymnastics allowed for the adoption of garments that were rejected by most of society in previous decades, such as bifurcated skirts and Bloomers (or “Turkish trousers,” as was the preferred term). These early activity-specific garments laid the foundation for the separates that we now know as “active sportswear” in the fashion industry. Alice Austen, one of America’s first and most prolific female photographers, not only captured these leisure activities on film, but also participated herself. She was a master tennis player, sailor, hiker, and horsewoman. And wherever she went, and whatever she did, she brought her camera. Her photographs of adults and children at play are the center of this exhibition. 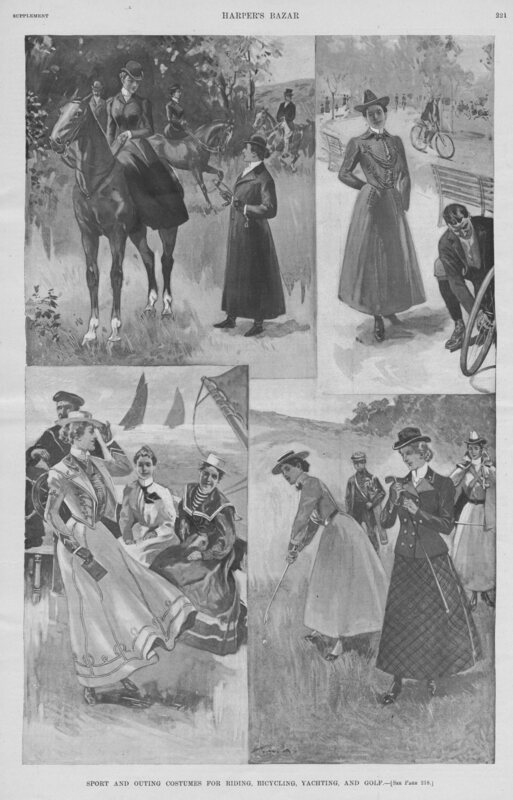 Tear sheets from fashion periodicals, advertisements, and newspaper articles from the time period, such as Harper’s Bazaar and Godey’s Lady’s Book, supplement Austen’s images. In addition, the exhibition includes two fully dressed mannequins: a woman’s croquet ensemble from circa 1884, and a bifurcated bicycling skirt and shirtwaist from circa 1895 and 1902, respectively. All garments are borrowed from the Graduate Study Collection at The Fashion Institute of Technology. This entry was posted in Exhibition and tagged 19th Century Fashion, Alice Austen, Audrey Chaney, Jessica Barber, Sportswear. Bookmark the permalink.